In Post Captain, Captain Aubrey gives Dr. Maturin a narwhal (Monodon monoceros, aver. 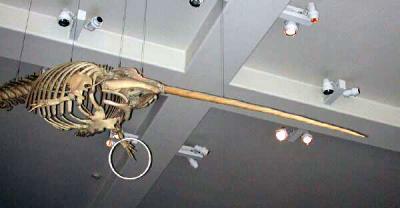 length 16 ft.) tusk. The Doctor thanks him and replies, "It is perfect - the very apotheosis of a tooth." Even though these tusks were passed off as unicorn horns, they are (as you can see), the left front incisor of the male narwhal. Narwhals are toothed whales, but the males alone have this one tooth, and the females have none at all. In The Hundred Days, there is a discussion about the function of this tusk, and almost 200 years later we still do not have a definite answer. They cannot be used for feeding, as the females do not have a tusk and obviously must obtain food too. There is little evidence that they are used for defense or combat. I think they are used for display, that is to attract the female narwhals. Among marine mammals, the female provides all the extra care needed to raise the next generation. She provides the extra calories to support the unborn calf, she provides the extra calories for the young after birth in the form of milk. She provides the instruction on how to breathe, where to travel, and what to eat. All the male provides is his genetic heritage. The female is obviously looking for the best genes she can find, as she is going to invest so much of her time and effort. This long tusk advertises the good health and survival skills of the male. That is something like a platinum card, a Lexus, and Armani clothes for the human male, and leads to the same result. Well, this is a lot of mammals, but there is one reptile that we have to talk about.